Description: MEC U23B #281, B&M GP40-2 #317 & D&H GP39-2 #7420 on NE-84 northbound through Clarks Summit, Pa. Description: MEC U23B #281, B&M GP40-2 #317 & D&H GP39-2 #7420 on NE-84 northbound through Scranton, Pa. about to pass under Linden St. 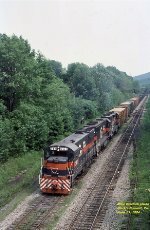 Description: A roater shot of an ex D&H U23B that Guilford "transferred" to the Maine Central, along with a more traditional looking B&M unit.